Mariana Guadalupe Fonseca of Ventura will speak on behalf of her fellow traditional undergraduate degree recipients. (THOUSAND OAKS, Calif. – May 3, 2018) Two first-generation college students will address their fellow graduates — and two others will graduate together as father and son — at California Lutheran University’s 2018 Undergraduate Commencement on Saturday, May 12. An estimated 825 students are eligible to participate in the ceremony, which begins at 10 a.m. in William Rolland Stadium. Of those, 727 are traditional undergraduate students and 98 are in the Bachelor’s Degree for Professionals program. 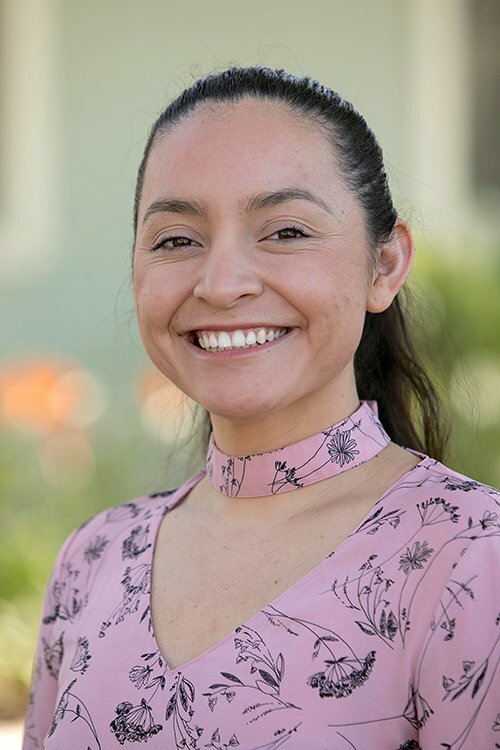 Mariana Guadalupe Fonseca of Ventura will speak on behalf of her fellow traditional undergraduate degree recipients. Originally from Guanajuato, Mexico, Fonseca was 3 years old when she arrived in the United States. She grew up sleeping with her parents and four siblings on the floor of a studio garage. She became involved with Student Support Services at Cal Lutheran, mentoring other first-generation college students. She is graduating with degrees in psychology and sociology. First-generation college student Gilbert Downs of Camarillo will speak on behalf of Bachelor’s Degree for Professionals students. Inspired to go back to school to earn a bachelor’s degree later in life, Downs earned two associate degrees from Moorpark College and then transferred to Cal Lutheran, where he majored in organizational leadership. He works at Moorpark College. Father and son Daniel and Danny Chavez of Oxnard will be the first members of their family to graduate from college, and they will do it together. Daniel, 41, dropped out of high school. Raising Danny on his own from age 5, he encouraged his son to get the education he hadn’t. When Danny started at Cal Lutheran as a marketing communication major, Daniel started taking classes at Ventura College while continuing to work full time. Daniel then transferred into Cal Lutheran’s Professionals program to earn a degree in business management. He told Danny, who is now 22, that his goal was to graduate with him. Siri Eliason, a Thousand Oaks resident who served on the Board of Regents from 1994 to 2003, will receive the 2018 Honorary Alumni Award. Her leadership was key in a successful $93 million capital campaign. She applied her business skills to her service and always thought in terms of growth – more students, more professors, more facilities – and what it would take to achieve it.